In a recent post about Brian Ross and the despicable behavior of ABC News, I included examples of what I categorized as deliberate and accidental media bias. Here’s a good (or perhaps I should say bad) example of accidental bias, demonstrating how statist premises get incorporated into news reports. Here’s how the Associated Press began a recent story about expected increases in the poverty rate. At first glance, the story seems fine. 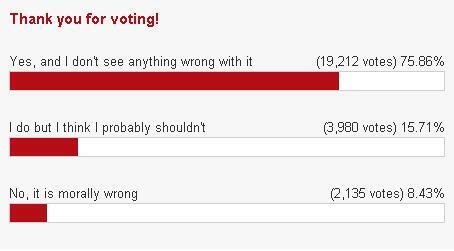 After all, I’ve already reported on the record number of people living in poverty under Obama’s watch. But my complaint is about the latter part of the sentence, which blithely assumes that the so-called War on Poverty improved the lives of poor people. Check out this chart, which I first posted back last September. 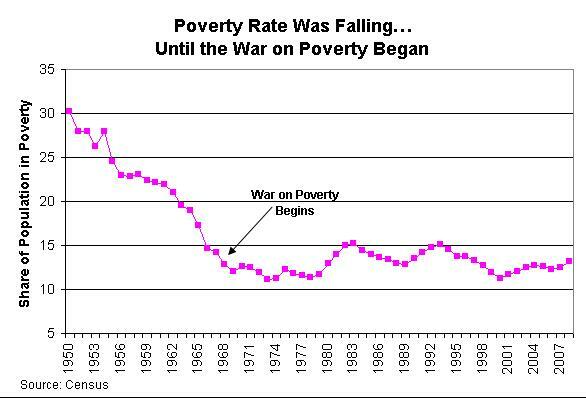 As you can see, the poverty rate in America was falling at a rapid clip, but progress stopped once the so-called War on Poverty began. And ever since, the poverty rate has stayed relatively constant, oscillating between 11 percent-15 percent. To be sure, this chart doesn’t prove that Lyndon Johnson’s redistribution programs – such as Medicaid – halted the progress that was being made. The left, incidentally, does have their spin on the story. They basically cherry pick two data points and make it seem as if the diminished rate of progress during that time period was because of the War on Poverty. …poverty never fell below a 1973 low of 11.1 percent. That low point came after President Lyndon Johnson’s war on poverty, launched in 1964, created Medicaid, Medicare and other social welfare programs. “I’m reluctant to say that we’ve gone back to where we were in the 1960s. The programs we enacted make a big difference…,” Edelman said. That’s creative, but not convincing. What the data really show is that we were making good progress before LBJ imposed all his redistribution. But that rapid progress turned into slow progress and then basically came to a grinding halt within a couple of years. If that’s evidence of success, I’d hate to see what failure looks like. If anything, the data show the benefits of moving policy in the other direction. During the Reagan years, for instance, redistribution programs were constrained and the poverty rate began to fall. And during the Clinton years, welfare reform and other market-friendly policies led to another drop in the poverty rate. But that’s a separate issue. The main point of this post is to expose a remarkably flawed and inaccurate bit of bias embedded in an Associated Press report. I suspect it was accidental bias, presumably from some reporter who lives in a bubble and automatically assumed that government programs are like fairy dust and have magical effects. In reality, of course, government programs tend to make problems worse, and that’s definitely been the case with the supposed War on Poverty. We have record levels of food stamp dependency, with more and more people being trapped in lives of dependency. But watch this video and decide for yourself. P.S. With support from left-wing international bureaucracies such as the OECD, the Obama White House wants to rig the poverty numbers to justify even more redistribution.